Several months after the blockbuster deal, business is thriving for traditional supermarket chains. Meanwhile, Whole Foods is facing its own set of challenges. Amazon's (NASDAQ:AMZN) $13.7 billion acquisition of Whole Foods last June sent shockwaves through the grocery industry like almost nothing before it. Stocks plummeted across the board. Kroger (NYSE:KR) lost 9.2%; Walmart (NYSE:WMT) fell 4.7%; Costco Wholesale (NASDAQ:COST) gave up 7.2%; and Sprouts Farmers Market (NASDAQ:SFM) dropped 6.3%. The conventional wisdom at the time was that Amazon would slash prices and expand delivery, pressuring margins across the industry. However, several months after the e-commerce giant took over Whole Foods, the reality has been almost the opposite as those competitors have posted strong results. Walmart had its best quarterly comparable sales growth since 2010 in its third quarter. At Costco, comparable sales have surged 7% in the U.S. in the first 17 weeks of the fiscal year, excluding the impact of gas prices. 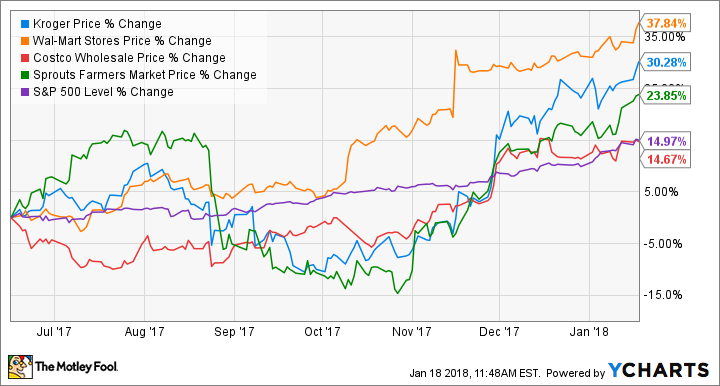 Sprouts posted a 4.6% increase in same-store sales in its most recent quarter, and Kroger got back to positive growth after a brief dip. An Amazon locker insider of a Whole Foods. Image source: Whole Foods. In fact, if you had bought a basket of these stocks the day Amazon acquired Whole Foods, you would have nearly doubled the return of the S&P 500. The combination of Amazon and Whole Foods was billed as a perfect marriage by much of the business media, who claimed that it was sure to disrupt the grocery industry. However, that argument overlooked a few key facts. First, even with Whole Foods, Amazon's annual grocery sales are a pittance compared to industry giants like Walmart, Costco, and Kroger. Whole Foods recorded $16 billion in revenue in the fiscal year ended last September, and Amazon tallied $2 billion in its own online grocery sales last year, giving it a roughly 2% share of the U.S. market, which is valued around $800 billion. It's hard to rewrite the rules of an industry with such a small slice of the pie. Furthermore, both Whole Foods and Amazon Fresh were struggling before the acquisition, meaning in many ways, the deal was forged out of weakness rather than strength as many seem to think. Amazon launched Fresh, its grocery delivery service, back in 2007 in its hometown of Seattle, slowly expanding it to cities across the country. However, the service never gained a significant market share, even in the cities it competed in, causing the company to branch out with other grocery experiments like a cashier-less convenience store, grocery pickup kiosks, and finally, the Whole Foods acquisition. Whole Foods, meanwhile, had seen comparable sales decline for eight quarters in a row before the acquisition, and operating income, adjusted for the merger, dropped by about 20% last year. Despite its strong brand in natural foods, Whole Foods has lost market share in recent years as Kroger and Costco have launched their own private-label products, and it has struggled to respond to that challenge. In other words, Amazon acquired a strong brand in Whole Foods but got a company in the midst of a transition that's having far-flung consequences throughout its operations and supply chain. In May, Whole Foods announced plans to cut costs by $300 million a year by 2020 via initiatives like store labor transformation, supply chain optimization, and accelerated order-to-shelf rollout. The upshot of those changes has been an epidemic of empty shelves, frustrated employees, and disappointed customers, according to a report from Business Insider. That report pins the blame for those problems on the transition to the order-to-shelf system, which has employees directly stock deliveries onto trucks, rather than putting goods in back storerooms. The intention is to lower inventory, improve efficiency, and cut costs, but instead, it seems to be resulting in a rash of shortages. As an online retailer, Amazon lacks its own expertise in brick-and-mortar operations so it has little to draw on to help solve such problems at Whole Foods. Unlike Walmart or Kroger, it doesn't have its own format it can stamp on to Whole Foods to recast it in its own image. While there have been some synergies between the two companies, such as adding Whole Foods 365 brand goods to Amazon's website and stocking Amazon lockers inside Whole Foods, the attention on such moves seems to be overshadowing problems within Whole Foods itself. Amazon and its founder and CEO Jeff Bezos think long-term, and it would be a mistake to discount the impact the company can have on the supermarket industry over the next decade or so as it makes strides in improving delivery, its automated checkout technology, and fully integrating Whole Foods. According to One Click Retail, Amazon was the leader in online grocery sales last year, doubling second-place Walmart's online sales. However, the traditional grocery giants aren't standing still. Walmart is adding 1,000 more grocery pickup stations this year, on top of 1,000 it's already opened, and sees 40% growth in US e-commerce this year. Kroger is also expanding its own click-and-collect program, Clicklist, and Costco just launched its online grocery program for non-perishables and is partnering with Instacart to deliver perishables. Walmart and Kroger have also been busy experimenting with their own cashierless technology. The grocery industry will continue to evolve at a faster pace than it ever has before. While Amazon is likely to try to disrupt the traditional model, the predictions that the company would crush the legacy operators have proven misguided. Traditional grocers are alive and well, and they appear poised to shape the future as much as Amazon would like to do itself.